The project partners are looking back on a busy and productive second year of EUth. It was dedicated to piloting and further improving the OPIN platform. Project coordinator at nexus, Kerstin Franzl, recaps: "The progress of the last 12 months is impressive. In spring 2016 the foundation of the platform was laid. 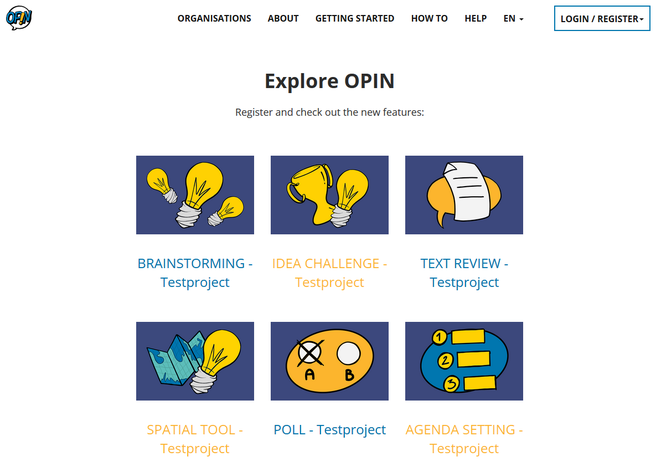 Now the features are basically developed and although we are still in the testing phase, you can already see that OPIN is not just a digital participation tool – it is a full environment for initiators to combine online and face-to-face-participation processes." This article gives you an overview of the second years’ milestones and the project in action. After the initial release of OPIN in February 2016, the pilots’ included the platform in their participative activities during the second project year. Each pilot tested OPIN during all phases of their participative process. Their valuable feedback contributed to further improving the platform. After the first release of OPIN at the end of the first project year, the partners decided not to wait with a second release until the end of year two. Instead they opted for further releases in between – four in total. This facilitated a frequent implementation of feedback as well as more opportunities to test new functions. “Looking back, these intermediate steps helped a lot to develop a more functional and user-oriented second version of OPIN”, explains Kerstin Franzl. Another innovative building brick was added to the platform: the Decision Support Tool. It especially helps inexperienced initiators to find the participative process that fits best to their needs. They just need to answer a few simple questions and OPIN will offer the matching participative process. Initiators can then directly enter the platform’s dashboard and set up the process. The Open Call, a mayor marketing activity, also started in the second year of the project. Youth organisations and administrations from all over Europe had the opportunity to apply for 10.000 € to set up and carry out their youth participation project on OPIN. Out of the 28 applicants, 10 projects were selected by an international jury in January 2017. The Open Call partners will not only give additional feedback on the usability of OPIN but also help to spread the word about the platform in different parts of Europe. We are already looking forward to seeing the results of these processes by the end of 2017. The integration of the FlashPoll management in OPIN allows initiators to have one single administration interface during the entire process from poll creation to its results.